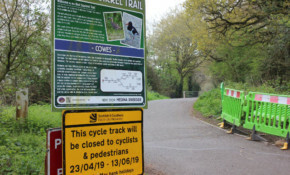 Island Roads and Scottish and Southern Electricity (SSE) are working to minimise disruption during important work to renew high voltage cables beneath the Cowes to Newport cycle track. As part of a safety talk, delivered to schools and youth groups by Island Roads, 1st Godshill and Rookley cubs formed teams to dress up Brian in full personal protection equipment. A red squirrel that has set up home - possibly as it prepares to give birth - in branches of a tree that needs to be cut down as it's blocking a path, has been offered a "swanky new home". Staff from Island Roads raised enough money for this charity to buy a new puppy and for it to be trained, so it can provide assistance to a disabled young person on the Isle of Wight. Island Roads are seeking advice from wildlife experts on how they can take action on a fallen tree without affecting squirrel drey.